In December 2018, PADEP rolled out draft rules that would impose new air emission controls on existing oil and gas sources. The draft rules are based upon Control Technique Guidelines (CTG) issued by EPA in 2016 as part of the Obama administration’s Climate Action Plan Strategy to Reduce Methane Emissions. Under the Clean Air Act, the CTGs act as guidance to states that are in moderate or severe nonattainment for ozone and are therefore required to develop reasonably achievable control technology (RACT) requirements for sources of volatile organic compounds (VOCs). As a state in the Northeast ozone transportation region, Pennsylvania is required to adopt and submit regulations that implement RACT for any source of VOC covered by a CTG. The CTG issued in 2016 was based, in large part, on a New Source Performance Standard (NSPS) promulgated by EPA in May 2016. EPA, however, commenced a process to reconsider the NSPS in June 2017 and proposed revisions to it in October 2018. As part of the reconsideration, EPA has stated that it will continue to review broad policy issues in the May 2016 rule, including the regulation of greenhouse gases from the oil and gas sector. In light of the NSPS reconsideration, EPA proposed a withdrawal of the CTG in March 2018. In response, PADEP submitted comments that argued against withdrawal of the CTG. Notwithstanding the proposed withdrawal of the CTG and revisions to the May 2016 rule, PADEP has chosen to move forward with a proposed RACT rule that largely adopts the 2016 CTG. The draft RACT rule covers various oil and gas sources including storage vessels, natural gas-driven pneumatic controllers, natural gas-driven diaphragm pumps, compressors, and fugitive emission components at well sites, natural gas processing plants, gathering and boosting stations. PADEP’s proposed RACT rule, however, requires more frequent initial leak monitoring and applies a stricter control applicability threshold to storage vessels installed on or after August 10, 2013. The draft RACT rule does not directly regulate methane emissions, but PADEP has asserted that the VOC controls will also reduce methane emissions from existing oil and gas sources as a co-benefit. 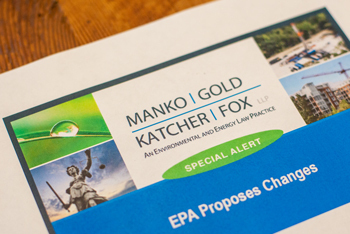 Industry groups have urged PADEP to hold off on moving forward with the proposed RACT rule until EPA takes formal action on the 2016 CTG. Environmental groups, on the other hand, have referenced Governor Wolf’s 2016 methane reduction strategy for the oil and gas industry in Pennsylvania, and urged DEP to press forward using the agency’s authority under the Pennsylvania Air Pollution Control Act. For its part, PADEP has indicated that it currently intends to move ahead with the draft RACT rule in 2019, in part to demonstrate that VOC emission reductions from existing oil and gas sources are technically and economically feasible, and will reevaluate its authority to issue the RACT rule under state law if and when EPA changes or withdraws the 2016 CTG.